Today there seems to be an underlying assumption that chivalry is all about men in armor riding around questing, jousting and conquering, while the women sit helplessly in their towers and castles with nothing to do but sigh and swoon. This perception is largely due to the attitudes of the neo-Gothic revival of the 19th century. Authors, such as Sir Walter Scott and Alfred Lord Tennyson, and painters such as Frederic Leighton and John William Waterhouse, melded the stories and images of King Arthur and the Knights of the Round Table with a Victorian sense of gallantry, which delineated a passive role for women. But this role would have been quite alien to the audiences of the Middle Ages, for whom tales of Arthur and Guenevere were not wistful reminiscences, but evocative and timely social commentaries. To see the real place of female characters in Arthurian literature we must look beyond the gender-biased affectations of the 19th century. Women in medieval literature played an active and integral part in the development of the Code of Chivalry. Certainly, Guinevere, Isoud, Elaine and the other ladies of Arthurian legend didn’t put on armor and ride into battle, but neither did they sit quietly on the sidelines. Male characters in Arthurian legends portray the practical side of chivalry — they are characters of action. Female characters, conversely, represented the intellectual side of chivalry — they are characters of reflection. Whenever a knight accomplished a great deed, he (or perhaps his vanquished foe) returned to Camelot to recount his actions to the Queen and ladies of the court. 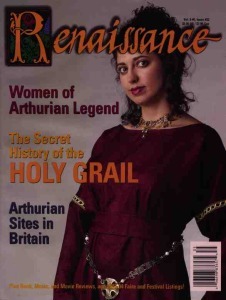 Feminine involvement in the tales of King Arthur was surely more than mere idealism. These stories were being presented to a 12th century audience who had grown tired of centuries-old adventure stories that featured predictable heroes such as Roland, El Cid and Beowulf. They wanted stories that reflected contemporary values and expectations. It is hard to imagine a Queen like Eleanor of Aquitaine (to whom the poet Wace dedicated his tales of King Arthur in 1155) tolerating stories in which a woman’s only purpose was to serve as frilly window-dressing for battles and tournaments. So Guenevere was undoubtedly a role model for attitudes and actions of ladies in medieval courtly society. This article originally appeared in Issue #33 of Renaissance Magazine. To find out more about this publication, visit their website .